The jaw-dropping impact that Bernie Sanders’ fiscal proposals would have the national debt seems to be growing by the month. On Thursday, the Committee for a Responsible Federal Budget said the Vermont lawmaker’s agenda, including his single-payer health care plan, could add as much as $19 trillion to the debt over the next ten years. That’s up significantly from an estimate the committee released just last month that put the sticker price somewhere between $2 trillion and $15 trillion. What changed in just a month? Well, two new estimates – one from the Center for Health & Economy and the other from the Urban Institute – found that the health care plan "would cost dramatically more than the campaign-provided estimates suggest," according to the committee’s updated analysis. "As a result, we no longer provide a 'low health cost' estimate based on the numbers cited by the Sanders campaign," it adds. Under current law, the debt is set to rise from 86 percent of gross domestic product by 2026. But if Sanders’ proposals were enacted it would almost double, reaching 154 percent of GDP by 2026. The updated analysis is the latest in a string of third-party estimates stretching back to last September that conclude that a Sanders administration would explode federal spending with his policies, such as free public college tuition and universal child care. Democratic frontrunner Hillary Clinton has routinely lambasted Sanders for offering policies that sound good on the stump without providing details on how to actually pay for them. The Sanders campaign contends that his proposals are indeed fully paid for and would actually lower deficits by $2.8 trillion over a decade. 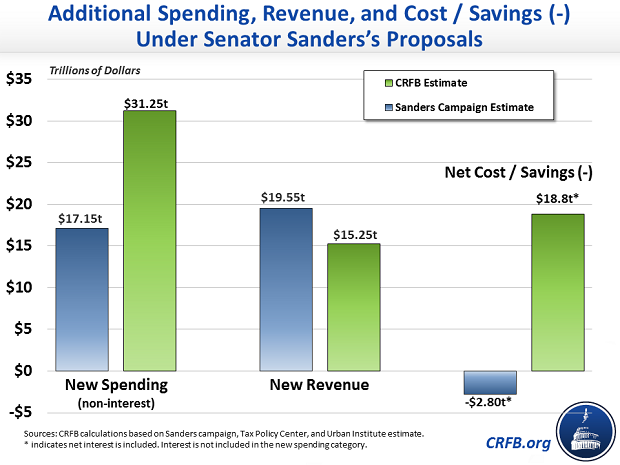 However, CRFB says that after looking at all the independent estimates out there, Sanders’ tax proposals don’t raise enough revenue to pay all the bills for his agenda. Meanwhile, the committee estimated that Clinton’s proposals would add about $200 billion to the existing debt, while presumptive GOP presidential nominee Donald Trump’s policies would boost the debt by about $12 trillion over 10 years. Correction: This article was corrected to reflect the estimate by the CRFB of the effect of Hillary Clinton’s tax proposal on the U.S. debt. The correct figure is $200 billion over 10 years, not $2 trillion as the article originally stated.